You are visiting London and want me to show you the sites. I just know you wouldn't be interested in a 150 year old pub with a history and tales to tell. I just know you would rather this corner was a glass tower with a Starbucks at ground level and loads of offices and apartments above it, that's why you've travelled half way around the world, right? I know you'd be impressed with how much money the developer has made in the past couple of years right? Isn't that the measure of success? The Pub sells Pieminister pies (a successful company based in Bristol that uses locally produced ingredients), they are proud of their selection of real ales, craft beers, lagers, single malts and selection of wines. It's a live music venue with an in-house-label for regulars with their CD's on sale at the bar. Locals, both the hipster type, and the regular oldies rub shoulders here over their preferred tipple. (Charles Dickens lodged just up the road as a child). The owner of the building is a company registered in an off-shore tax haven - isn't that a measure of success? 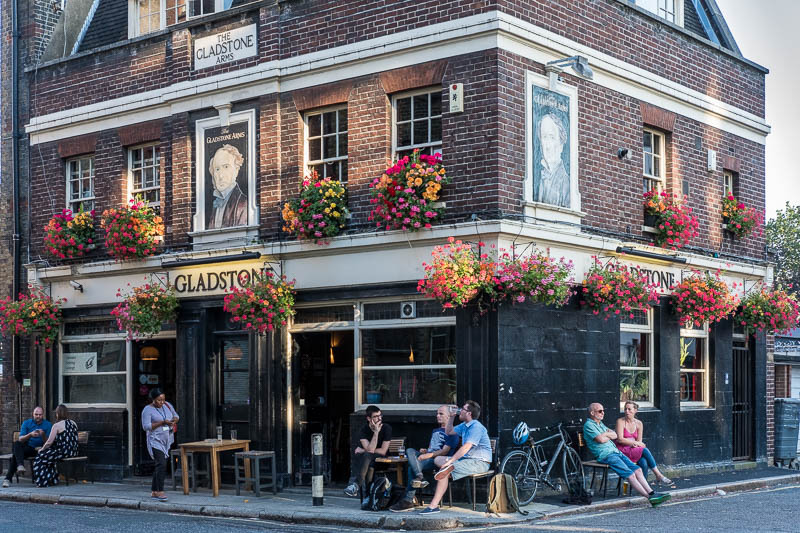 Locals want to keep their pub just as it is. They won the battle to prevent the demolition of the pub. However now the pub has been advised of the new rent increase that takes effect in October, it will mean the pub has to close. That's OK though as the landlord will get more rent from the new tenant. Isn't that a measure of success? Oscar Wilde said "people know the price of everything and the value of nothing". This Saturday supporters will do a pub crawl around other threatened pubs and end up here at the Gladstone pub. Why don't you join them. There are lots of jerks whose bottom line is more money. He doesn't need this building, he just wants it regardless of what the community wants or says and it adds to his obnoxious portfolio. That makes you want to smack the landlord upside the head. If I was there I'd join the pub crawl! So sad to hear this kind of story! What a shame a real community corner pub, with traditional ales and pub grub. Unfortunately because of all the reasons listed these old pubs are slowly disappearing. What a beautiful pub! Sad that they struggle to be around! I like what Oscar Wilde said.... It is so true. That looks like a 'Free House' so the landlord is indeed looking to sell to developers. He will make a decent sum, the regulars will be chucked out. Disgraceful, but that is London life. I would join you on the pub crawl if I was there. I hate to see things like this happen. It's such a great looking place. So much nicer that a tall, glass building. It definitely is distressing what's happening to London. New high rises everywhere, where only the rich can live, and new weather patterns at ground level. Victorian London seems to be disappearing. Next is anything that references the Victorian period. Bye, pub. Drink a tall one for me.